" River of the West - The Maribyrnong "
This river has been treated as the Cinderella of Melbourne's two rivers. Few people seen to mention it except rather hastily. So let me give it the honour of a web page that it deserves. The name is from the Aboriginal words, Mirring - Onag - Nong. 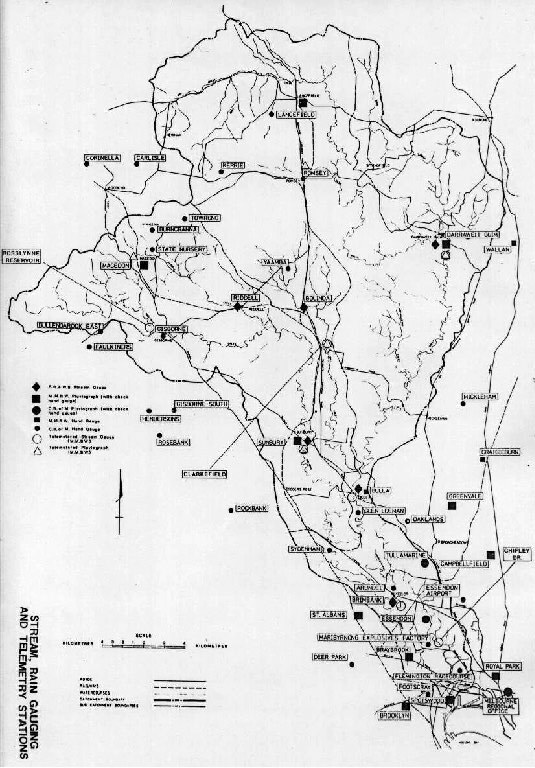 It rises west of Lancefield in the Great Dividing Range near Heskitt at the base of Mount Macedon and flows for 160 kilometres (100 miles)through rural, suburban and industrial areas where it joins the Coode canal in the Port of Melbourne to flow into Hobson's bay. Draining an area of 1412 sq. kilometres (545 sq. miles). 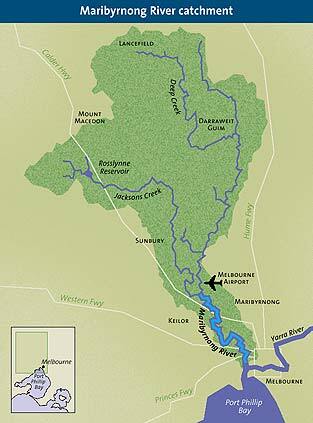 The upper reaches of the Maribyrnong is known as Deep Creek, other creeks are Jacksons and Emu creek. In general the river is a young system cutting its way through the basalt plains with very deep cuts about 50 million years ago. 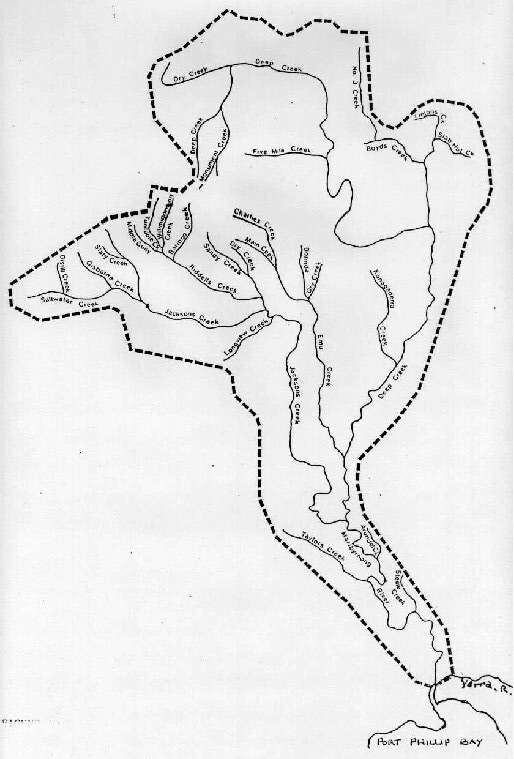 The first Europeans to ascend the river were Lt. Robbins in command of the Cumberland, Charles Grimes Surveyor General of New South Wales, James Flemming the Botanist / Gardener, 3rd of February 1803. "(Fawkner and Batman arrived 32 years later.)" Welcome aboard the Blackbird ferry 1926 / 1927 circa ex. Lake Entrance for your cruise on the tidal section of the river moving along the boundaries of the cities of Melbourne, Maribyrnong, Moonee Valley & Hobsons Bay. Some may argue that they are not missing anything, for the lower section is port related, industrial and to some is neglected and untidy. A working & mooring area for private boat and yachts. But be prepared for some fine industrial smells and occasional junk on the banks, you cannot but notice the height and different type bridges over the river. Sweeping along the river we enter another environment with parkland in Footscray and Flemington racecourse on the Melbourne city side of the river. Passing the Footscray sailing, rowing and canoe club. People fishing from both banks indicates that the river is improving and will return to it's title of "Melbourne's bream stream". Housing on whisky hill in the Ascot Vale area creates a miniature park along the river while on the other side we have Commonwealth held land Ammunition factory being converted to housing and parkland. Occasionally race horses can be seen in the river being exercised. With a 9 hole public golf course on the bank of the river in Moonee Valley. While on the Maribyrnong side we have what was the Hume Pipe site, was also the Melbourne Meat Preserving Company a very historical site in the valley, now held by Parks Victoria. It is the home of Melbourne Living Museum of the West. Looking over the Maribyrnong / Raleigh Rd. bridge the Anglers Tavern flags flutters in the breeze marking a convenient watering hole on the bank of the river. The bandstand in Maribyrnong park has been restored, new additions the Boathouse and Tearoom. Passing the terracing we can see the Angling club & Essendon rowing club, which was the first fully licensed rowing club in Victoria and the oldest north of the Yarra. 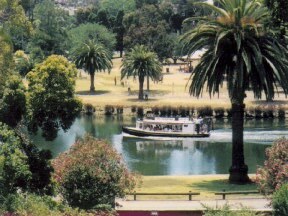 The tree lined avenue around the river is the Essendon boulevard or Avenue of Honour, leading to Riverside park with Bar.B.Q's & play equipment. Looking to Maribyrnong we see some fine old homes with magnificent backyards which are part of the flood plains. The steps of the old Maribyrnong swimming hole can be seen in the bank of the river. Further on a part of the river which does not have much public access which creates an area for passive and mental relaxation, passing high cliffs of sand and lava from a far distant time, within an area of varied bird life protected by the Cordite factory built on the Fisher Estate. We then see Steel / Rose creek entering the river, which was the site of the wine hall garden & camp site of the late Mr. Nick Libertz who was the guardian of the river doing his best to keep it clean. He appreciated it's rules and moods. The land pass Nick's place is covered in native trees planted by Melbourne Parks & Waterways which is now Parks Victoria, leading to more hilly country, with large house in Avondale Height and East Keilor, thick bankcover keeping a country atmosphere. Another bend and the old River Tea-garden site comes into sight with the old jetty piles standing like sentries guarding the shore line entrance to the gardens. What a sight it must have been in its heyday a 1000 people enjoying themselves, dancing to Waltz, Foxtrot, Quickstep or playing tennis, viewing the Birds, Kangaroos, Emus, Wallabies and Wombats through out the gardens or just sitting down to enjoy a picnic, maybe a Devonshire tea. We continue on to the Canning St. reserve in Avondale height which is in the city of Moonee Valley and the end of our cruise of 12 kilometre, out of 16 kilometre of tidal length, of river length 160 kilometre.